So far, the gathering and consumption of wild food has received little attention in the Ecosystem Service literature. Many quantifications and valuations of Ecosystem Services even completely ignore this iconic service. In a new paper in Ecological Economics, a first EU scale quantification of wild food as an ecosystem service is presented by HERCULES researchers Nynke Schulp and Peter Verburg, together with Wilfried Thuiller. Using data from a wide range of sources, ranging from species distribution modelling to gastronomy, an inventory of the availability and values of wild food in the EU was made. The inventory shows that more than 10% of EU citizens collect wild food, about 20% consumes wild food regularly. 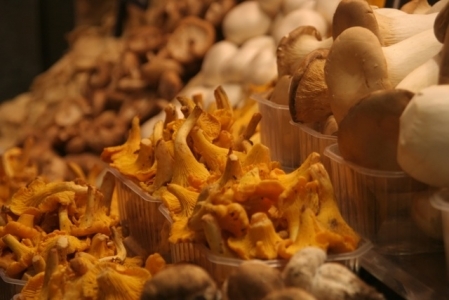 A large variety of plant, mushroom and game species that are consumed were identified. About 150 different species are widely collected throughout the EU, including red deers, chanterelles, wild garlic, and many wild fruit species. Another 600 consumed species were identified whereof consumption was regionally specific, sometimes unless a EU-wide distribution. The review of the motives for wild food gathering and the socio-economic backgrounds demonstrates that wild food is particularly important as a cultural ecosystem service. It contributes to the connectedness people feel with the region they live in; and fruit and mushroom picking, gathering herbs and hunting are highly appreciated recreational activities. Cultural landscapes are essential for providing humans with ecosystem services in general and this specifically applies for wild food. Cultural landscapes are the places where people interact with the more natural landscapes where these services are available, which is necessary for collecting wild food close by people’s homes. Additionally, these are the landscapes that humans historically have managed in such a way that they actually provide benefits. Careful management of cultural landscapes, including consideration of wild food availability, is needed to ensure a sustainable provision of ecosystem services from cultural landscapes.